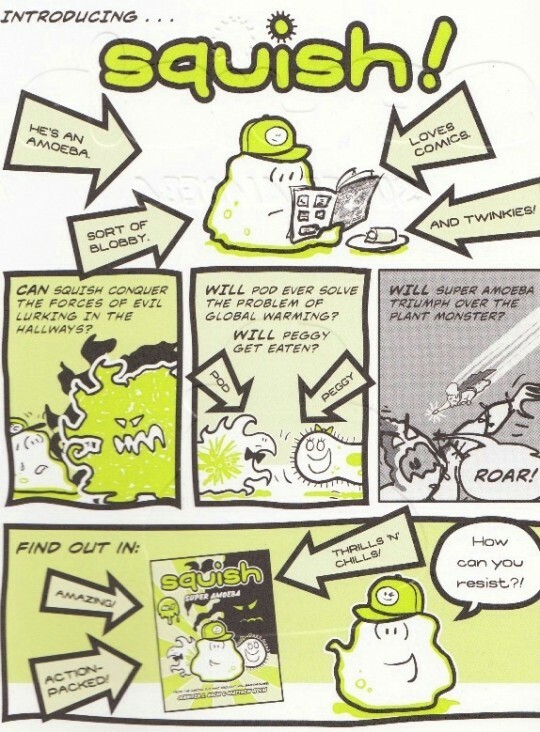 He’s squishy, he’s blobby, he’s got no arms…introducing Squish: Super Amoeba, here for your world-saving needs! When scary Lynwood, the bully amoeba from detention, makes plans to eat Peggy Paramecium, Squish has to muster up his courage and stand up for his friend! Brought to you by the creators of Babymouse, this children’s graphic novel is full of imagination, bright illustrations, and is sure to appeal to the elementary school crowd. I couldn’t help myself-he’s so adorable, and the captions and illustrations are so funny; this kind of book is just irresistible to me. There is plenty of elementary school goofy humor, real-life problems (bullying) handled with equal parts lightness and compassion, AND a huge bonus-my alter ego in a graphic novel. That’s right, everyone-I found her. Peggy Paremecium. SHE’S SUPER CHEERFUL, FOLKS! 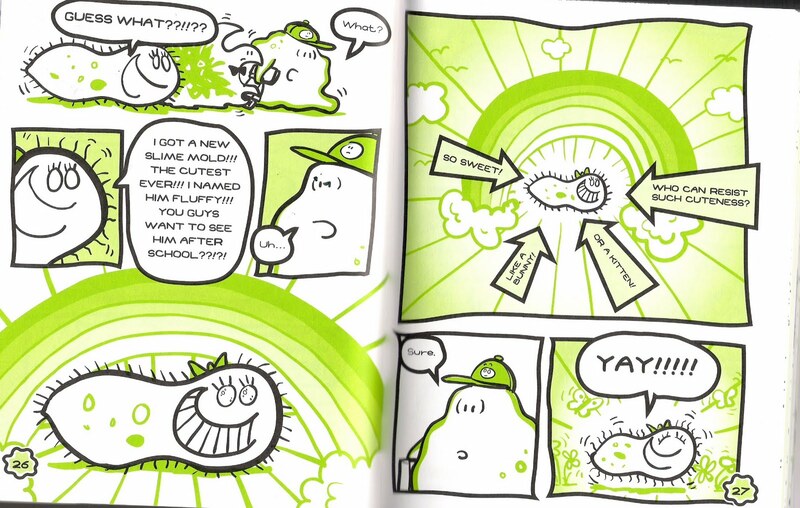 Extra bonus: this is an awesome series, so you can read all of Squish’s adventures! Look for the changing expression on his hat, and the SUPER COOL science experiment and amoeba-drawing pages in the back of each book! You’ll love this one, I’m sure of it. Better still, even those kiddos who struggle a bit with reading will be able to progress with this book. It’s a great sense of accomplishment to finish an entire book, and the Squish series has all the ingredients for a crowd-pleaser, even a crowd that is not too sure about all this reading business. I waited foreeeeeeveeeeer for Squish No. 1 to make it back on the library shelves before I could check it out! Holm, Jennifer H. And Matthew. 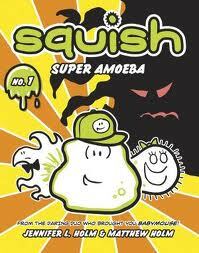 Squish: Super Amoeba. New York: Random House, 2011. 90 pp. Want more? Let’s read our way through! If you’re all Squished out, you’d probably like the Babymouse and Lunch Lady graphic novel series.